I’m on a roll… 2 weeks. 2 cakes. | ReLocavore: Redefining "local"
I’m on a roll… 2 weeks. 2 cakes. Much to the dismay of my waistline, I seem to be on a roll with baking cakes. This week? Chocolate and vanilla marbled bundt cake. I based my cake on this recipe at Allrecipes.com. I thought the marbling would be difficult, but it just involved making the batter, splitting in half, then mixing cocoa powder into half. I spooned big dollops of alternating flavors of batter into the pan, then ran the back of my wooden spoon through the batter to create the marble texture. The batter texture was very thick, I think to allow the chocolate and vanilla to stay separate. To top the cake, I dusted the whole cake with powdered sugar, then cut a slit in a piece of parchment and used that template to coat the narrow strips with cocoa powder. Pro tip: Before filling your wire mesh strainer with powdered sugar or cocoa powder, run it through the flame of your gas burner for 5-10 seconds to make sure it’s very dry. This cake baking binge is starting to eat away at our store of butter. With the price of butter expecting to spike, I may have to stock up if this cake binge is going to continue. What’s next week? I was thinking apfel kuchen. Other ideas? 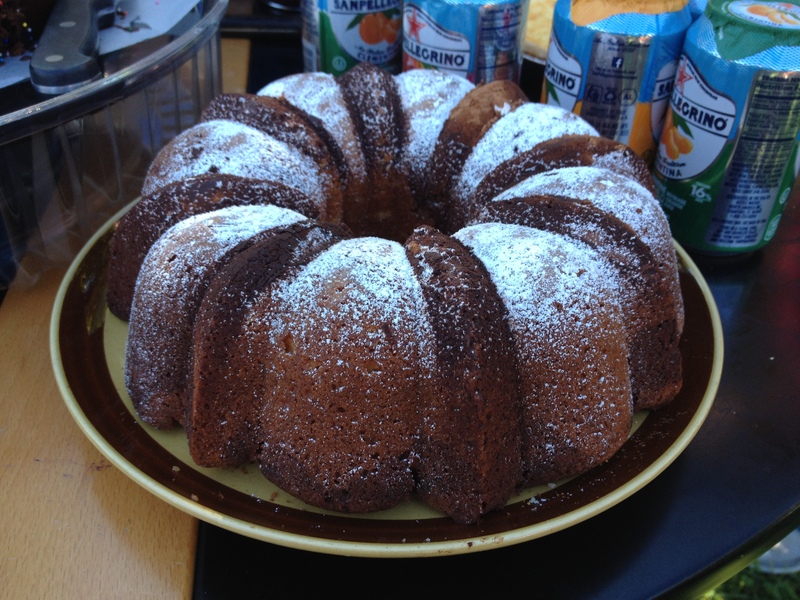 Categories: Cooking | Tags: baked goods, baking, bundt, bundt cake, bundt pan, cake, chocolate, marble cake, powdered sugar, recipe, recipes, vanilla | Permalink. This time of the year I will be harvesting carrots. Your grandma’s carrot cake is still one of my favorite cakes. She didn’t grow fresh carrots though and so I believe my carrot cake is much more delicious than her carrot cake. The caramel icing that I prefer over cream cheese frosting is a labor of love but since I only make carrot cake once a year, I will labor for this icing. Her secret ingredient was black walnuts, which you know is another of my loves. I hope I can find some at the Amish Farm grocery store. BTW have you ever made a pumpkin roll? Perhaps with it being almost pumpkin season you could try that cake. I haven’t made a carrot cake in years. We’re also harvesting some tasty carrots so that might be a great idea. I have a handwritten copy of her recipe. I’ll post it when I bake her cake.